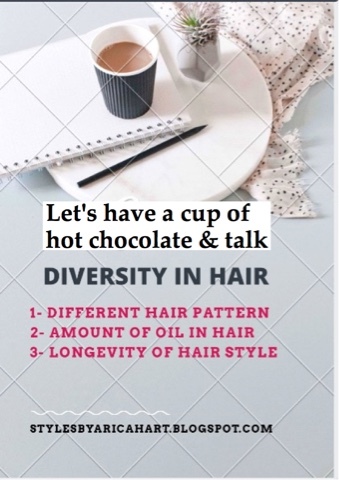 Let's have a cup of hot chocolate and talk - Diversity in hair !! all have different ranges of beautiful colors, thickness, and wave patterns. 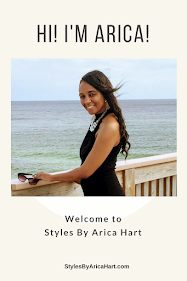 As African American and Caucasians, we have different and unique ways of styling and keeping our hair healthy and beautiful. I'm writing this article because I have been asked this question by my friends & clients of both nationalities. So let's talk about it all you beautiful ladies and gentlemen! No pattern is better then the other. You just have to learn to manage your type of hair, which ever it may be. Just know that Most African Americans have a tighter curl pattern in their hair then Caucasians. That is why they relax, press, or embrace their natural hair. Either way is beautiful; as long as, it's kept neat and healthy.The tighter curl pattern is not limited to just black though. For example, In high school, I had a Caucasian friend with red, tightly curled hair. She was not mixed, but had the tighter curl pattern in her hair. For the most part Caucasian hair has a straighter or loser pattern then African American. Either way, all you ladies and gentlemen are beautiful, no matter your race or hair texture. You rock and are awesome! Have you ever wondered why Caucasians shampooed their hair more often or vice versa? Well because of the amount of natural oils in the hair. Caucasian hair seems to produce more oil; therefore, causing the hair to need a shampoo more often. Most African Americans will go about 5-7 days before shampooing their hair. Some may even go 2 weeks. One reason is because African Americans don't have excessive oils in the their hair. They tend to have to add oil to their hair to keep it from drying out and causing unnecessary breakage. Another reason is because they tend to wear styles that last a little longer in their hair type. These are just a few of the differences between African American and Caucasian hair. Therefore, Always keep your hair neat and stunning no matter what type of hair you have. The Curl pattern, amount of oil, and amount of time an individual can wear a style may vary; but beauty is universal. Have a blessed and enjoyable day ! !